Seems like a week or two ago, Twitter has done away with their support for RSS. Taylor Singletary from Twitter support said in a Twitter Help thread, "Twitter no longer supports RSS as an output format." RSS for Twitter is something I've used for search subscriptions myself. Following different search personalities or saves queries and subscribing to them via RSS is a feature I enjoyed and benefited from. No longer. If you try to access it yourself, you'll get a notification that says "The Twitter REST API v1 is no longer active. Please migrate to API v1.1." but API v1.1 doesn't support RSS. Now if you want to subscribe to a Twitter timeline or search via RSS you need to use a third-party service. For example, to subscribe to my Twitter timeline you can use Twitter-RSS.com. 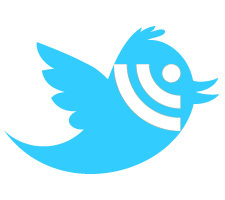 I made that Twitter RSS icon, not bad - eh?